Monopartite, linear, dsDNA genome of about 230 kb predicted to encode more than 170 open reading frames. The genome contains terminal and internal reiterated sequences. Mouse cytomegalovirus (MCMV) uses m152 and m06 encoded proteins to inhibit surface expression of MHC I molecules . Murine cytomegalovirus m38.5 protein interacts with host Bax in infected cells and thus inhibits Bax-mediated cell death . The m36 gene product termed M-vICA plays also a role in cell death suppression . The conserved UL24 family of human alpha, beta and gamma herpesviruses induces a cell cycle arrest at G2/M transition through inactivation of the host cyclinB/cdc2 complex. MCMV encodes an UL24 homolog that performs this role . In addition, the IE3 protein is able to arrest cell cycle in G1/S transition or in G2/M. 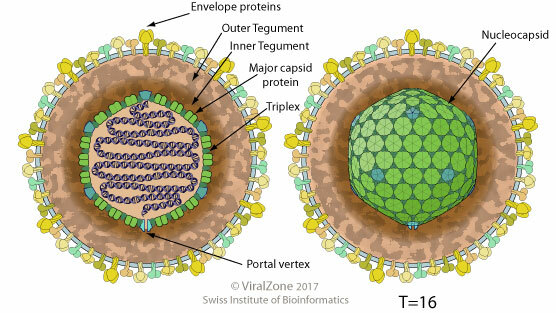 HCMV inhibits the cascade leading to production of interferon-beta by targeting host IRF3 protein with the viral pp65 protein. The m157 protein delivers inhibitory signals to NK cell subsets expressing Ly49I or Ly49I-like inhibitory receptors. Another protein, m04 forms complexes with MHC I and escorts them to the cell surface. This mechanism prevents NK cell activation by restoring the “self” signature and allowing the engagement of inhibitory Ly49 receptors on NK cells. Four other MCMV proteins m145, m152, m155 and m138 are involved in the down-modulation of NKG2D ligand expression. HCMV UL69 modulates the host mRNA expression by exporting unspliced mRNA, thereby inducing alternative splicing.